With 2015 being the International Year of Soils , our recent soils training for PNGs first forestry inventory is of particular note. 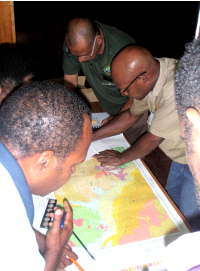 The Papua New Guinea Forest Authority, with the support of FAO and the EU, is currently preparing the first national forest inventory for Papua New Guinea (PNG). The inventory will be the basis for planning sustainable forest management, a key element of a national forest monitoring system and a major source of data for a national greenhouse gas inventory. 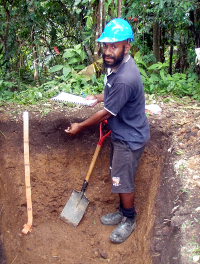 A core group of 16 foresters and forest scientists were selected by the PNG Forest Authority to undertake training in soil sampling, soil description and record-keeping techniques that will be required for the forestry inventory. The training was run in December 2014 by the Forest Practices Authority, Hobart and jointly funded by The Crawford Fund and the UN-REDD (the United Nations collaborative initiative on Reducing Emissions from Deforestation and forest Degradation in developing countries). 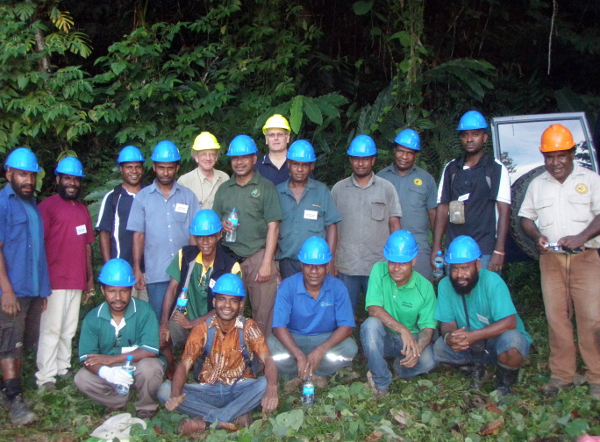 The course was held over five days at the Forest Research Institute in Lae (Morobe Province). The indoor sessions concentrated on providing foresters with information on geological history and rock types, as well as providing training on landforms, landscape processes, basic soil concepts and soil classification. The highlights of the week’s course were the field sessions: firstly a look at the soils in the institute’s grounds, then a study of a toposequence of soils at the National Agriculture Research Institute, and lastly a field session in the schist steeplands of Oomsis Forest. Here participants were asked to assess landforms, select sampling sites in landslide-prone terrain, describe profiles and sample for soil carbon. As a result of the training there is now a pool of foresters who will be able to supervise soil sampling and description for the forestry inventory project. They also have a better understanding of the fundamentals of geology and soils science which will enable them to reduce risks in forest operations, particularly in steep and erosion-prone country.